Finding friends is often a major challenge for people moving abroad: only 57% of expats worldwide find it easy to make new friends abroad, and an even lower share of 45% say that making friends with local people in their new country of residence is easy. Based on the latest Expat Insider survey, one of the most extensive studies about living and working abroad, InterNations has compiled a ranking of the best and worst countries for finding friends. 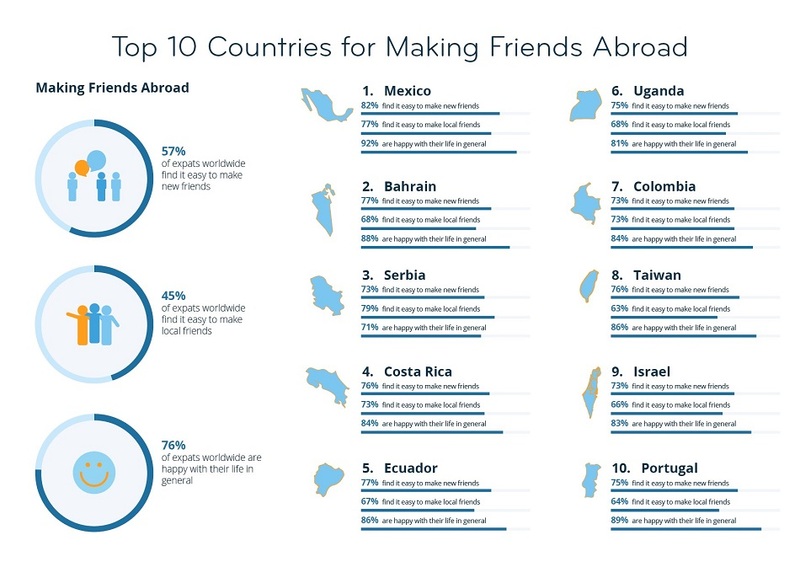 Mexico is the best country for making friends abroad, followed by Bahrain, Serbia, Costa Rica, Ecuador, Uganda, Colombia, Taiwan, Israel, and Portugal. At the other end of the scale, expats in Kuwait (68th out of 68 countries), Sweden, Denmark, Switzerland, Saudi Arabia, Germany, Norway, Finland, Austria, and Estonia (59th) find it hardest to make friends in their respective host countries.